Josh Phangurha introduces us to the fascinating world of arachnids and specifically the effect of environmental variables on web design. Spider webs are one of the most beautiful and complex structures in nature, but we have a tendency to overlook them as they are quite a regular occurrence (and for some people, a nuisance) in our day-to-day lives. The main function of a silken web is to capture prey, but have you ever thought about how spiders could maximise prey capture by altering their web design? After reading literature about this idea that presented some interesting results, my fascination that an animal possessing a brain around the size of a pin head could modify a complex insect-snaring trap encouraged me to investigate this further for my BSc dissertation project. Image 1: The zig-zag shaped stabilimentum of the Wasp Spider. Could these web decorations have attracted this spider’s prey (a now immobilised butterfly) to its doom? 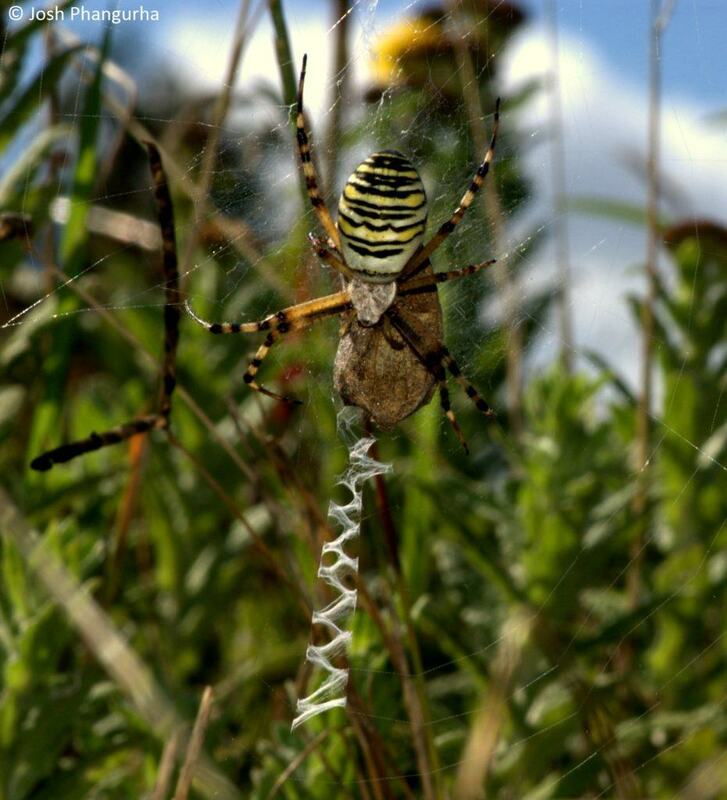 I live in Southampton, where I am lucky enough to have easy access to Monks Brook Meadows, which is home to the striking Wasp Spider Argiope bruennichi. Although these spiders construct the typical two dimensional orb web, they also add web decorations that are formally known as stabilimenta. Stabilimenta are built by Argiope species worldwide and occur in an array of forms such as zig-zags, ‘X’ shapes and spirals. The function of stabilimenta is highly debated, but there are two main theories that have been tested in previous studies. One suggests that stabilimenta function as a conspicuous signal to larger mobile animals, such as birds, to prevent the web being accidentally destroyed. The other suggests that web decorations reflect UV light and attract insects towards the web, much as the colourful petals of a flower would. Wasp Spiders construct their webs inconspicuously close to the ground in dense vegetation. Birds are unlikely to fly through this type of microhabitat so it seemed viable to test how A. bruennichi web structure changes in response to varying light intensity. This would test the UV reflectance theory of stabilimenta, but temperature and humidity were also recorded out of curiosity. Most studies like this have been lab based, but I wanted to carry out a field study to see how naturally varying weather (and thus varying light intensity, temperature and humidity) influences web construction to better understand web building by Wasp Spiders in the wild. Image 2: This diagram shows the web aspects that were measured. A. bruennichi stabilimenta are constructed below and sometimes above the hub in the form of a vertical zig-zag. 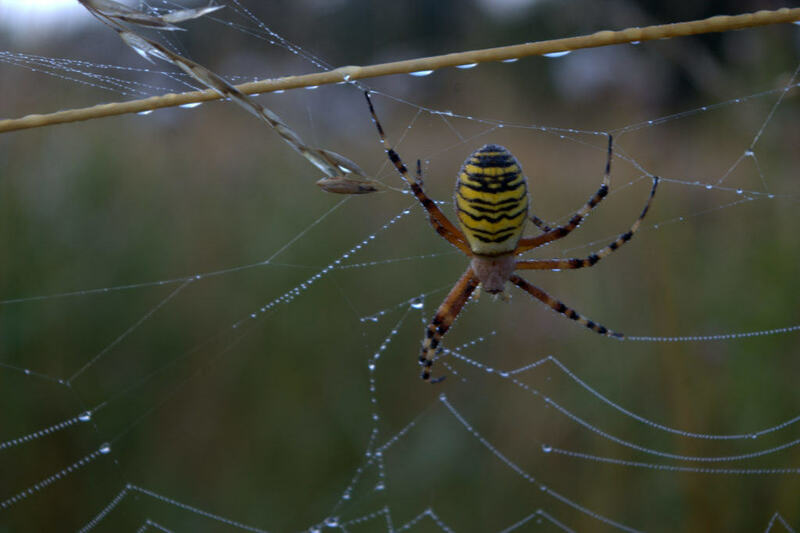 Wasp Spiders rebuild their webs every day at dawn (image 3), so sampling took place at 07:00 almost every day between July and September 2015. Webs were thus freshly built with little damage from prey capture. Web measurements were taken for a number of webs after the recording of the day’s environmental temperature, humidity and light intensity. Web measurements included web height, hub height, mesh height, radii number and stabilimentum length (image 2). Stabilimenta on A. bruennichi webs are constructed vertically below (image 1) and sometimes above the hub. Image 3: A Wasp Spider in the process of rebuilding its web at dawn. The fresh silk collects morning dew beautifully! Before attempting to interpret relationships between the weather and web construction, it was important to keep in mind that building a web is energetically expensive for the spider. Presumably this would mean that the spiders would alter web design to maximise prey capture success, while being as silk-efficient as possible. The spiders did not always build a stabilimentum, but when they did choose to build one it appears that they did so in lower light intensities (Figures 1 & 2). 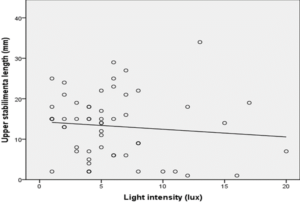 Stabilimenta would be more necessary in lower light intensities, when insects are less active, in order to enhance prey attraction via UV reflectance. 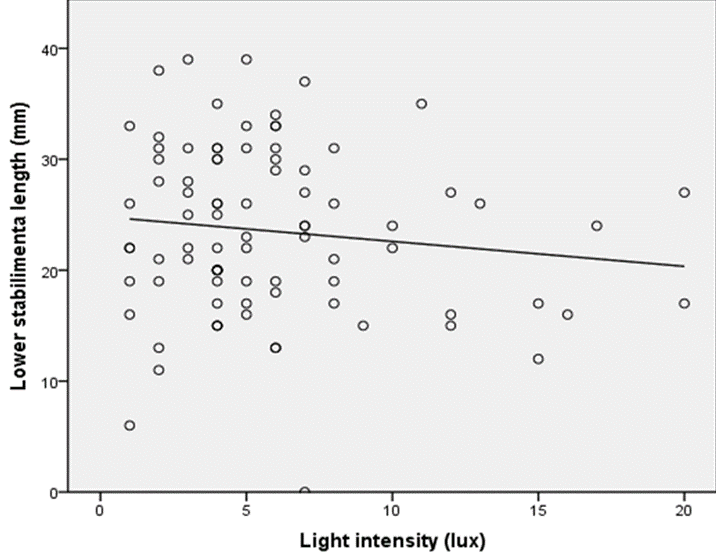 However, this is an observation of the data and no statistical tests were carried out to determine the significance of stabilimenta presence in lower light intensities as only stabilimenta length was measured. Figure 1: Most of the data plots for the length of lower stabilimenta (below the hub) of each web occurred in lower light intensities below 10 lux. Figure 2: The same observation was made in regards to the length of upper stabilimenta (above the hub). 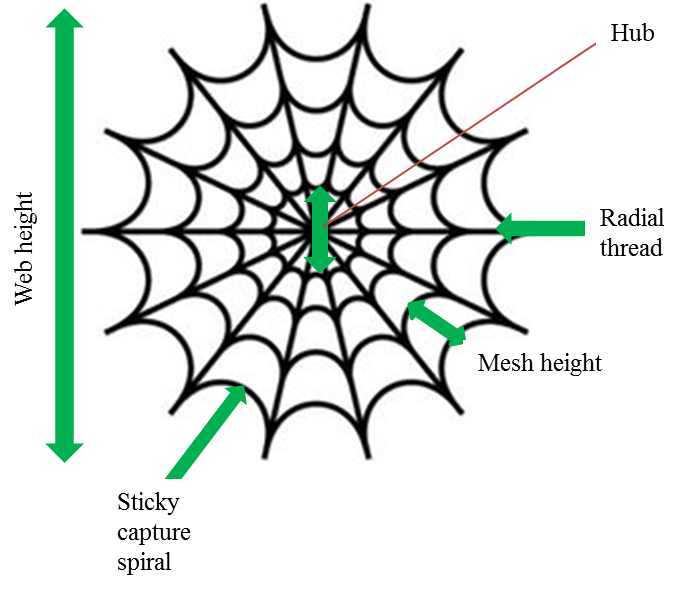 The spiders built more radial threads in higher temperatures (Figure 3). Radial threads are the ‘scaffolding’ for the spider to expand upon, but they are reported to be mainly responsible for dissipating kinetic energy generated from insects hitting the web. 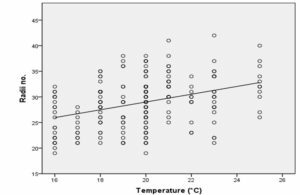 So the relationship between radii number and temperature could be explained by increased insect activity in warmer temperatures. More radii would then be necessary to dissipate the increased kinetic energy caused by prey impacting the web at a higher rate. This also lowers the chance of the web being destroyed and thus avoids the spider wasting energy by building a new one. 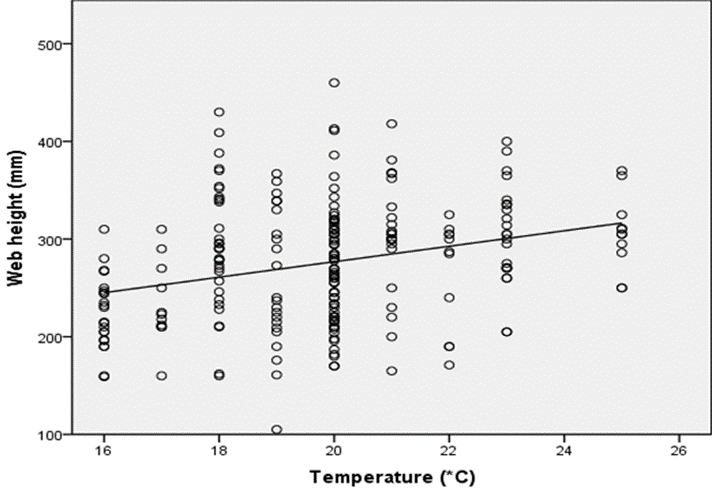 Figure 3: A significant positive correlation was found between the number of radial threads and temperature. Most orb weaving spiders are unable to adequately produce eggs without consuming large prey, which could explain why web height increased in higher temperatures when prey (and larger prey) availability would be higher (Figure 4). This implies that the spiders may base their web design on the highly beneficial event of catching a very large prey item. As web height increases, predator detection greatens, but perhaps the risk is worth it in order to promote successful reproduction. Figure 4: An unexpected positive correlation between web height and temperature. This study was driven by my love of Arachnids and my sheer fascination with potential validity of weather affecting spider webs. The added feature of stabilimenta intrigued me even further as it is a conspicuous and seemingly purposeful structure, yet it has generated endless debate over its function. So next time you come across an orb web, whether it is glistening with morning dew, full of immobilised insects on a warm summer’s day or blocking your desired path into the garden, there is more going on than meets the eye in this overlooked and ingenious structure. Eisner, T., Nowicki, S. (1983). Spider web protection through visual advertisement: Role of the Stabilimentum. Science, 219(4581), pp. 185-187. Herberestein, M.E., Fleisch, A.F. (2003). Effect of abiotic factors on the foraging strategy of the orb-web spider Argiope keyserlingi (Araneae: Araneidae). Austral ecology, 28(6), pp. 622-628. Sensenig, A., Agnarsson, I., Blackledge, T. A. (2010). Behavioural and biomaterial coevolution in spider orb webs. Journal of evolutionary biology, 23(9), 1839-1856. Venner, S., Casas, J. (2005). Spider webs designed for rare but life-saving catches. Proceedings of the royal society B-Biological sciences, 272(1572), pp. 1587-1592. How does Red-eyed Tree Frog Agalychnis callidryas embryo escape danger?